Matter at the smallest scale is made of elementary particles, pieces of matter that cannot be divided into anything smaller. As scientists over the past century have looked deeper and deeper into the atom, they have found the smallest things human beings have ever seen. How do they do it? The collision of particles at high energy, either with other particles or with a stationary target, allows physicists not only to look at what's inside these particles, but also to use the energy of their collisions to create different, more massive and more exotic particles of matter. To create such high-energy collisions, scientists must use very powerful particle accelerators. To make the simplest kind of accelerator, physicists use a battery and two parallel metal plates separated by a gap. They connect one plate to the positive battery terminal and the other to the negative terminal. The battery creates an electric field in the gap between the two plates. Positively charged particles that enter the gap near the positive plate experience a force and accelerate across the gap toward the negative plate, gaining an amount of energy that depends on the voltage of the battery. For a 10-volt battery, a proton gains 10 electronvolts, or 10 eV, as it accelerates between the plates. Putting many power supplies in a row, physicists have accelerated particles to millions of electronvolts (MeV). At some point it is impractical to increase the voltage between the metal plates, as sparks will begin to fly across the gap. To accelerate particles to even higher energy, physicists use a large number of metal plates, all with a hole in the middle. Using alternating currents, the plates can be charged either positively or negatively. A positively charged particle, such as a proton, is drawn to the negatively charged plate in front of it, flying toward the hole. When the proton passes through the hole, the voltage of the plate is switched to a positive value, giving the proton an extra push. At the same time the next plate in front of the proton becomes negatively charged, attracting and accelerating the proton. Hence every gap between two plates provides energy to the proton as long as the voltage of the plates is switched whenever the proton crosses a hole. In high-energy accelerators, switching the voltage happens several billion times per second, or gigahertz frequencies. Putting many plates in a row, physicists create linear accelerators, or linacs, that can accelerate charged particles to billions or trillions of electronvolts. The more plates and gaps a linac has, the higher the energy it can give to a particle – and the longer the linac gets. Rather than building longer and longer linacs, physicists are able to use magnets to guide charged particles in a circle. In doing so, physicists are able to send the particles again and again through the same set of plates, increasing the energy of the particles with each revolution. As the particles gain energy, it is more and more difficult to keep them on the same circular path. The strength of the magnetic field must be increased. Ring-shaped particle accelerators operate the most powerful magnets in the world. The power of a ring-shaped proton accelerator is limited by its circumference and the strength of the magnets that are used. Unveiling the tiniest constituents of matter with accelerators is only half the battle. Physicists also need extraordinary particle detectors to observe what happens in high-energy collisions. Detectors are instruments that count particles, visualize tracks, measure particle energies, record time of flight and identify different particles. Detectors can be as tiny as computer chips or as big as apartment houses, containing thousands of tons of steel and other material. Depending on the type of accelerator and the particles and forces to be studied, physicists combine various detection devices arranged in intricate configurations. In the case of colliding beams, physicists build a detector surrounding the point at which the two beams collide. Like the layers of an onion, such a detector contains successive layers of detection devices with different functions. Close to the center, physicists place precision tracking instruments such as silicon detectors and wire chambers. Those instruments are usually surrounded by calorimeters that measure the energy of particles passing through. 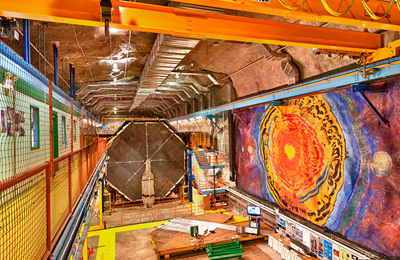 The outer shell of a detector, farthest from the collision area, is devoted to detecting muons, heavy electron-like particles that can travel a couple of kilometers through rock and steel before decaying. One of the most important tasks of the detector electronics, called triggering, is the selection of collision signals that are interesting enough to be recorded permanently for later examination. It is unnecessary and impossible to keep the ten thousands of detector signals created every millionth of a second. Physicists build and program the detector hardware to perform several levels of go or no-go decisions before passing the data to the next, more sophisticated level of processing. Physicists use detectors to analyze particles made not only in the laboratory, but in outer space. Researchers use detectors to study particles from space as they approach and enter our atmosphere in forms such as cosmic rays, gamma rays and neutrinos emitted by the sun. These experiments allow researchers to test theories about how the universe was formed, what it is made of and what its future holds. Detectors are the product of international collaborations of physicists, all contributing their own expertise and the support of their home institutions. In return, each physicist receives access to the data recorded. To simplify the networking and data exchange within these worldwide collaborations, scientists at the European research laboratory CERN invented the World Wide Web. High-energy physics laboratories such as DESY, SLAC and Fermilab were among the first to offer Web pages in their home countries. To analyze the enormous amount of data, particle physicists have always relied on some of the most powerful computers in the world, quickly adopting new computing technologies. The analysis of particle physics data takes place on powerful and cost-effective PC farms. Comparing simulated collision events with experimental results, sophisticated computer programs can identify the processes that took place in each collision, whether it takes place when two beams collide or at a fixed target. Physicists use the results to test theoretical predictions, improving our knowledge of crucial parameters, contradicting theoretical expectations and discovering new phenomena.